I used to think that Buddhism was compatible with modern science, but not anymore. This idea that Buddhism and science are compatible was popularised in the 1960s and 70’s by authors like Fritjoff Capra, who in his best selling The Tao of Physics had argued that Western science and Eastern religions were now converging. In the 1990’s, former monk Stephen Batchelor argued the case for a socially engaged, secular western Buddhism free from its cultural and religious accretions in Buddhism Without Beliefs – a book that subsequently prompted me to investigate for myself what Buddhism had to offer. Anuttaro purisa-damma-sārathi satthā deva-manussānaṃ buddho bhagavāti. (Unexcelled trainer of those who can be taught, teacher of human and divine beings; awakened; blessed). Moreover, the Kalama Sutta – so often wrongly interpreted as meaning that we are free to basically pick and choose what bits of the Dhamma accords with our own (deluded) experience – is actually a call for faith in the Buddha, though not the blind faith one often sees in those who follow a theistic path. The faith that’s being talked of here is more akin to trust or confidence that Buddha’s advice will yield good results (i.e. enlightened liberation from stress) if practiced sincerely and intelligently, neither accepting it on hearsay nor rejecting it according to one’s personal prejudices. For years I operated under the humanistic assumption that the teachings on kamma and rebirth and cosmology were either cultural accretion, or else the Buddha may actually have given them in deference to the rigid social hierarchy of his time. But as Ven Bhikkhu Bodhi says, a quick glance through the Pali scriptures soon reveals that these claims just don’t bear up to scrutiny. Stephen Ruppenthal in Eknath Easwaran Tr), The Dhammapada (2nd Ed), Niligiri Press, 2007, p. 114. Ven. Bhikkhu Bodhi, ‘Does Rebirth Make Sense?‘, on Buddhist Publication Society website (accessed 20 February 2013). This entry was posted in Buddha & Buddhism, Commentary and tagged asian buddhism, attachment, buddha, buddhism, culture, faith, humanism, liberation, renunciation, science, secularism, western buddhism. Bookmark the permalink. Firstly, I agree of your desire to scrutinize Buddhism carefully, however, I don’t agree that Buddhism isn’t compatible with modern science (pure science – as an ongoing process of discovery) and while agree with most of the assertions made do not agree on your claim about creative thinking. 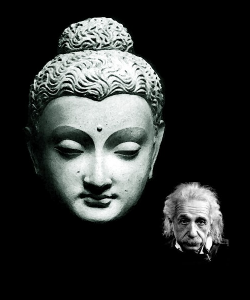 Hi Ben, many thanks for taking time out to read and comment on my evolving thoughts regarding Buddhism and science. It’s important that I get clear on such things and I really appreciate the feedback. When writing my post I probably should have explained my understanding of the modern scientific outlook, instead of naively assuming that we might all agree on this. Whenever I speak of science, I tend to have in mind a viewpoint that is essentially materialist and positivist, and I assume that in general scientists believe the natural world can be truly understood through theorising about observations and measurements. Professional scientists and interested lay persons might disagree with my simplistic notion, but what I’ve just described does appear to me to be a commonly held view – especially among atheist non-scientists who believe that science has more or less disproved all religious claims beyond reasonable doubt. Buddhism, on the other hand, appears to be asking us to wake up to these mind-creations, which in our ignorance we understand to be actual reality as opposed to mere conceptual (impermanent) models about reality. Buddhism is empirical in so far as its claims are to be verified through observation or experience, but unlike science its claims cannot be ‘proven’ through debating them in peer reviews. What is the aim of Buddhist practice? As I understand it, the aim is to attain liberation from the endless and painful cycle of death and rebirth by walking the Middle Way – a ‘razor edge’ between liking and disliking, as Bhikkhu Yuttadhammo describes it in one of his internet talks. Unlike the Arahant or even the Stream-enterer, unenlightened beings like myself are continually straying on to one or other side of the path, and it results in our feeling always discontented. In our ignorance, we resort to thinking creatively in order to maximise pleasure and minimise pain, and our intentional acts or kamma (for good or ill) keep us bound in samsara. But if we were enlightened we wouldn’t have to think creatively because our actions would always accord with reality – we’d just do whatever needs doing without thinking it through beforehand. Because our action isn’t based on intention here’s no kamma ‘ripening’ for us to experience at a later date. I agree that letting go attachment to our creative efforts is tough one, but is it not Zen that teaches ‘the finger pointing at the moon isn’t the moon’?